Building a custom metering, mixing, and dispensing system is dependent on the materials used and understanding of the application. Material specifications to consider include volume, ratio, abrasiveness, viscosity, specific gravity, pot life, and moisture sensitivity. Understanding the requirements of the application such as shot size, frequency, and accuracy are required before choosing which pump technology is suitable for your application. 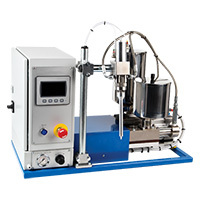 Fluid Research® offers two pump technologies, progressive cavity pumps and piston pumps. Progressive cavity pumps contain a single screw rotor that fills with material as the rotor spins. The pump flow can easily be regulated by adjusting the turning speed of the rotor. 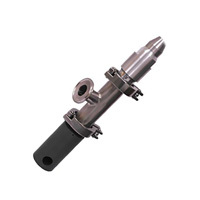 Therefore, a progressive cavity pump is ideal for applications that require a varied flow. This technology offers a larger range of capabilities and is designed specifically for abrasive materials. Piston pumps contain a piston that moves a defined distance through a cylinder pushing the correct amount of material into the mixing area allowing a repeatable and precise result. They can operate in a wide range of pressures and are best used for low to medium viscosity materials.